Specialised in sport stadiums, the “Stadium Database” website has since 2010 been launching the “Stadium of the Year” competition. In total, 32 stadiums opened in 2014 and thus entered the competition (full list of nominees here). 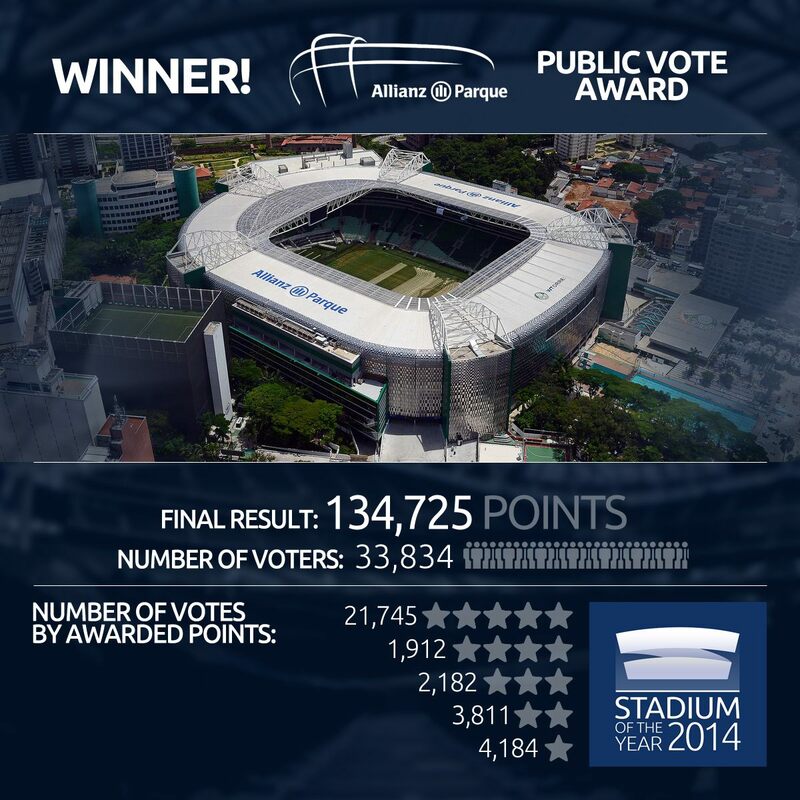 Today it was announced that the Allianz Parque, with close to 34.000 votes computing more points than previous years’ winners combined, had been chosen “2014 Stadium of the Year”. San Mamés (Bilbao) was the runner up with Otkritie Arena (Moscow) coming in third. In the jury vote, the Hazza Bin Zayed Stadium (Al Ain) came first, followed by Brazilian World Cup stadium Arena da Amazônia (Manaus). “Already before this year’s competition we knew Brazil will be a country well-represented in our Public Vote because of the spectacular World Cup stadia. After all, never before have there been 8 nominees from one country. Coincidentally, today, the Allianz Parque facebook page upped a series of pictures showing the progress of construction during four years, the transformation from Palestra Italia to Allianz Parque. Below, the thumbnail version: click on the image to go to Allianz Parque’s facebook site and the full version.